Portadown boss Ronnie McFall. Pic by PressEye Ltd.
Portadown manager Ronnie McFall has left Ballymena Showgrounds on numerous previous occasions with cause for concern. However, McFall made the trip home on Saturday evening encouraged by evidence of a return to form from his squad. Entering the Danske Bank Premiership test fresh from a dramatic 3-2 success at home to Carrick Rangers, the Ports clocked up another 90 minutes of progress along a path away from the misery of six consecutive defeats and towards what could prove a positive period. “I felt we did enough to win it on Saturday and could have been clear by a few goals at half-time,” said McFall. “We were in control at 1-0 and missed a great chance for a second goal. 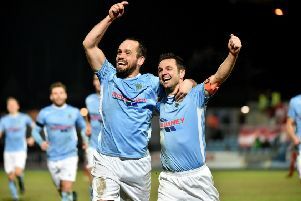 “We never find it easy down at Ballymena but the performance was certainly a step in the right direction. “After the Carrick win it was about pushing on and building on that result. “David Miskelly only had one real save to make, when he reacted to stop a David Cushley free-kick with his legs. Injury issues have forced McFall to reshuffle his pack across the season but the manager considers the opportunity to step up and take on extra responsibility one his senior players can embrace. “We had to play Chris Casement on the right side of midfield, with Chris Ramsey taking over at right-back,” said McFall. “We had no other option, with Jake Richardson on the substitutes’ bench but not really 100 per cent fit. Gary Twigg finished with an assist and added another impressive overall performance by a player considered foremost as a penalty-box poacher. Twigg, who now lives in Ballymena, had a reduced distance to travel to the match but clocked up plenty of miles on the pitch. “Gary worked his socks off,” said McFall. “He has the experience and desire to take on added responsibility.